A celebration of the music that transcends the generations! 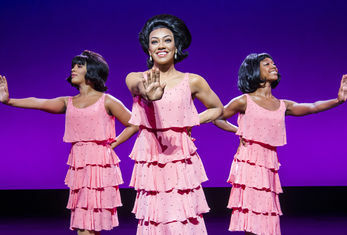 Discover the story behind Motown, the personal relationships, the professional struggles, and, of course, the music - as Motown The Musical heads for the Alhambra Theatre in Bradford, for a two-week run. Uncovering the true story of the legendary record label that changed music history and created the soundtrack of a generation, Motown The Musical features a live orchestra playing 52 tracks including Ain’t No Mountain High Enough, I’ll Be There, Dancing In The Street, Stop! In The Name Of Love, My Girl, and I Heard It through the Grapevine. A dynamic cast, show-stopping choreography, and breath-taking costumes bring to life the rags-to-riches story of Berry Gordy, the creation of the Motown record label, his relationship with Diana Ross, and how he copes when the hits begin to dry up. With 50 slick dance routines, and performances of 52 Motown songs, the cast don 200 costumes (the quickest costume change takes just 24 seconds) and 100 different wigs! Berry Gordy founded the Motown label in 1959 with just $800 borrowed from his family and went on to launch the careers of Diana Ross, Michael Jackson, Stevie Wonder, Smokey Robinson, Marvin Gaye and many more. The cast for the UK and Ireland tour includes Edward Baruwa who plays the leading role of ‘Berry Gordy’, Karis Anderson as ‘Diana Ross’, Nathan Lewis as ‘Smokey Robinson’ and Shak Gabbidon-Williams as ‘Marvin Gaye’.